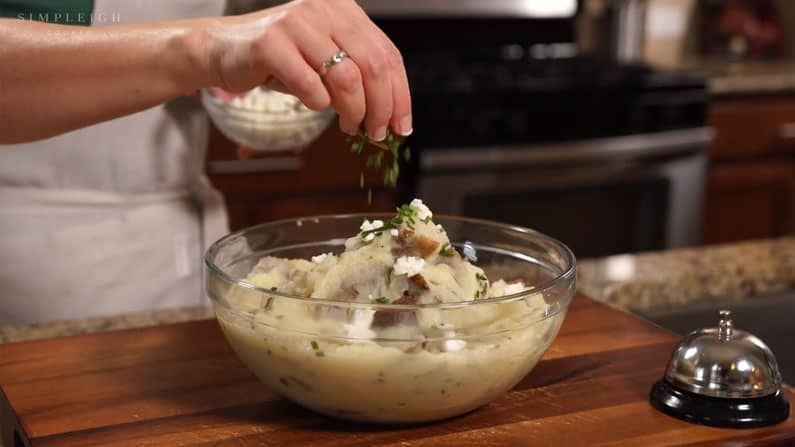 Everyone loves mashed potatoes, but this mashed potatoes recipe is especially irresistible because it has goat cheese, which creates an unparalleled creaminess. Plus, it beautifully complements the delicate flavor of the (optional but highly recommended) fresh chives. Instead of cow’s milk or cream, I use almond milk. Not only do we love it, but it’s easier on my husband’s and daughter’s systems. And you’d be surprised how wonderful these potatoes are using almond milk (frankly, nobody will notice you didn’t use dairy). This recipe only has four ingredients (not counting salt and pepper) and just two steps: First you boil, then you mash. Those two steps add up to a bowl of flavorful comfort and bliss that makes me want to dance! Fast, easy, wonderful and perfect for any weeknight or special evening entertaining (and impressing) friends. Goat cheese mashed potatoes. Trust me, you’ll love it. Place potatoes in a large pot and cover with cold water by 1 inch. Add almond milk and goat cheese. Add butter, salt, pepper and (optional) chives. Mash all ingredients with a potato masher until combined. Garnish with extra chives or goat cheese and get ready to dance!